On Wednesday afternoon, emergency personnel arrived at the scene of a serious car accident on the railroad tracks in Benton County. According to witnesses, a semi-trailer rig was crossing the tracks when a freight train slammed into the vehicle. The force of the collision split the truck’s cab in half and sent the debris flying into a field. What remained of the semi-truck stuck to the first train engine and caught fire. A fuel spill caused by the crash started multiple fires along the length of the train. The crash also knocked over a utility pole near the tracks, causing a power outage and an electrical hazard at the scene. Every emergency agency in Benton County had to respond to the scene to control the fires. Crews arrived at the scene to repair the fallen power lines. The 66-year-old driver was still alive with critical injuries at the scene of the train accident. He was airlifted to the hospital, but died later that day. No injuries were reported among the crew. According to reports, the trailer of the truck was empty; it was a fuel tank semi-truck. The train was carrying potentially dangerous cargo including lighter fluid and acid. After the crash, the train crew did not report any lost cargo or leaks. The Benton County Sheriff's Department is investigating the circumstances leading up to the crash. The crossing was unguarded, with no crossing arms or lights preventing vehicles from driving onto the tracks while a train is nearby. It was labeled with signs warning drivers about the private crossing. According to Gus Melonas, the spokesman for the train’s owners, the train was using its whistle while it approached the crossing. The train was owned by BNSF, a freight company that is active across the west coast. BNSF trains carry large loads through many major cities; a freight line that carries BNSF trains runs through the heart of downtown Seattle. Just weeks ago, a pedestrian was struck and killed by a BNSF train in the 100 block of South Holgate Street in Seattle. 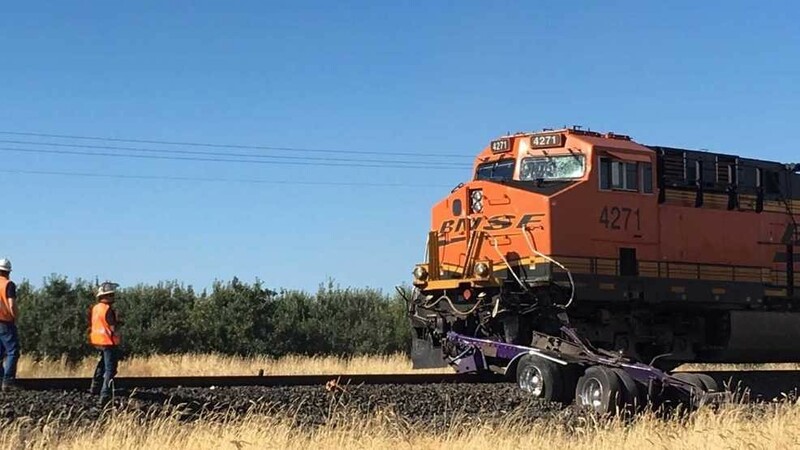 BNSF has recently been embroiled in some legal battles in Washington state over pollution along its tracks; its trains shed coal dust and other contaminants while carrying coal in uncovered cars. The company’s tracks have also been involved in wrongful death lawsuits. Not every case involving them has been successful. In 2008, a bicyclist was killed while crossing the BNSF tracks at a crossing point with no gates or signals. Under Washington state law, landowners cannot be held liable for unintentional injuries on their land if they make it available for public recreation at no cost; a judge dismissed the cyclist’s case.